To understand aneurysms, it is beneficial to understand the circulatory system of the brain. Blood is carried to the brain by two paired arteries, the internal carotid arteries and the vertebral arteries. The internal carotid arteries supply the anterior (front) areas and the vertebral arteries supply the posterior (back) areas of the brain. After passing through the skull, the right and left vertebral arteries join together to form a single basilar artery. 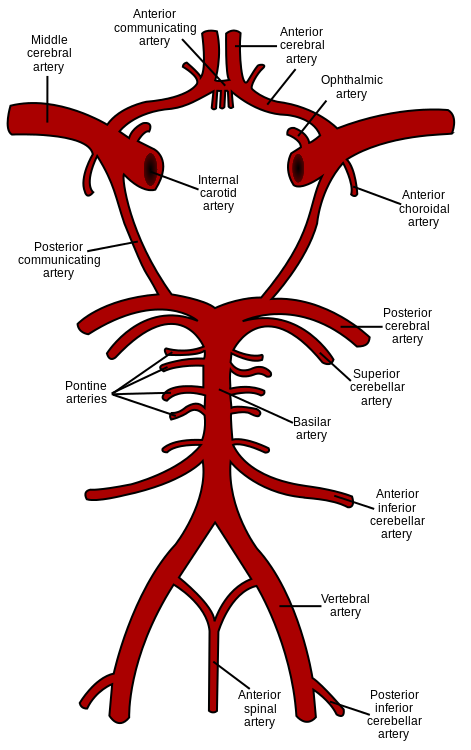 The basilar artery and the internal carotid arteries “communicate” with each other in a ring at the base of the brain called the Circle of Willis. Cerebral circulation is the movement of blood through the network of blood vessels supplying the brain. The arteries deliver oxygenated blood, glucose and other nutrients to the brain and the veins carry deoxygenated blood back to the heart, removing carbon dioxide, lactic acid, and other metabolic products. Since the brain is very vulnerable to compromises in its blood supply, the cerebral circulatory system has many safeguards. Failure of these safeguards results in cerebrovascular accidents, commonly known as strokes. The amount of blood that the cerebral circulation carries is known as cerebral blood flow. The presence of gravitational fields or accelerations also determine variations in the movement and distribution of blood in the brain, such as when suspended upside-down. The arterial cerebral circulation is normally divided into anterior cerebral circulation and posterior cerebral circulation. There are two main pairs of arteries that supply the cerebral arteries and the cerebrum: Internal carotid arteries and vertebral arteries. The anterior and posterior cerebral circulations are interconnected via bilateral posterior communicating arteries. They are part of the Circle of Willis, which provides backup circulation to the brain. 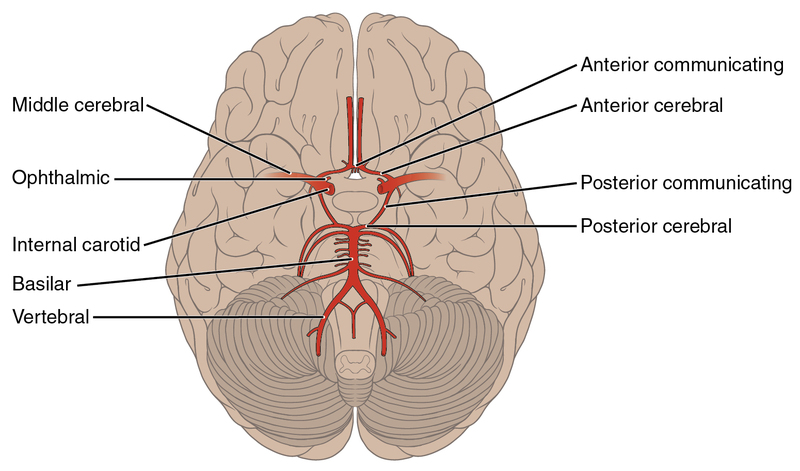 In case one of the supply arteries is occluded, the Circle of Willis provides interconnections between the anterior and the posterior cerebral circulation along the floor of the cerebral vault, providing blood to tissues that would otherwise become ischemic. Anterior communicating artery: Connects both anterior cerebral arteries, within and along the floor of the cerebral vault. Vertebral arteries: These smaller arteries branch from the subclavian arteries which primarily supply the shoulders, lateral chest and arms. Within the cranium the two vertebral ar teries fuse into the basilar artery. These are the pipes that transport blood pumped by your heart to your brain. As you can imagine, they are lined with a muscular layer to help maintain the pressure of the blood so that the furthest regions of your brain can get a steady stream of blood. The cells that make up the wall of the artery are not static. In fact, these cells are constantly growing and remodeling in response to the pressure from the blood within it to attempt to maintain, as much as possible, a smooth cylindrical shape. Veins are thin walled vessels which lack a muscular wall that drain blood after it has passed through tissues or organs. After they have passed through tissues or organs, they lose oxygen and are under very little pressure as it returns it to the heart to get pumped to the lungs. Veins outside the brain are usually more visible as blue vessels near the skin surface.